Vibrant™ combines the boosted cleaning power of high pH extraction powders with the instant solubility of a liquid. Vibrant™ is a clear liquid that is instantly soluble in water. No time is wasted stirring; just mix and use. Not only is Vibrant easy to use, it is also crammed full of active ingredients to provide you with the best clean possible in the least amount of time. Vibrant is highly buffered to maintain cleaning efficiency even under the highest dilution and most challenging soiled conditions. This concentrated detergent provides you with the flexibility to use the product at various dilution ratios without losing cleaning effectiveness. Vibrant provides corrosion protection for your equipment components and fittings. It is cost efficient due to its ultra-concentrated formula, providing for lower cost per use. Its unique blend leaves no soil attracting residue, leaving the carpet cleaned, refreshed, and smelling great. It contains special additives which condition hard water providing for better cleaning. Vibrant can be used with all types of extraction equipment – truck mounts, portables and self contained or walk behind extractors. 1. Always pretest for colorfastness in an inconspicuous area. 2. 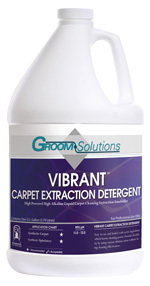 Vibrant Carpet Extraction Detergent works best when used as a compatible extraction detergent in conjunction with a Groom Solutions Traffic Lane Cleaner. 3. If used as a carpet cleaning detergent without a compatible prespray or traffic lane cleaner in a portable or walk behind extractor, mix one ounce of chemical with one gallon of water. Truck Mount: Mix one quart solution (32 ounces) with five gallons of water into solution container. Set solution flow meter between 2 and 3.